Project managers have traditionally always measured the actual project costs to their planned costs as documented in their project plans and budgets. There are a few possible variances a project manager could face. 1. Positive cost variance. This indicates that the project manager is well within spending and is under budget for project tasks or activities. For example, Task G had $6,000 planned against it, but only $4,800 was spent on this task. This indicates a positive variance of $1,200. 2. Negative cost variance. This indicates that there is a cost overrun on the project and that it is over budget for specific project tasks or activities. This is basically a red flag for the project manager. For example, Task D had $9,000 planned against it, but the project manager actually spent $9,600 on this task. This indicates a negative variance of -$600. The previously mentioned cost variances, unfortunately, do not take anything relating to the project schedule into account, and that's our problem. We have to rely on earned value to supplement our example in terms of schedule as well. Let's re-examine the cost variance scenarios again. Here we subtract our actual costs (actual cost of work performed, or ACWP) from our earned value (budgeted cost of work performed, or BCWp) to get our results. So, if Task G had $6,000 planned against it and had actual costs of ACWP = $4,800 and we assume we have earned a BCWP calculation of = $5,000, then the cost variance (CV) for Task G is BCWP - ACWP, which is $5,000 - $4,800 = $200. This indicates a positive cost variance of $200 and can be also seen as a cost saving of $200. Similarly, let's examine our other example. Task D had $9,000 planned against it and has actual costs of ACWP = $9,600. If we assume we have earned a BCWP calculation of $8,000 then the CV for Task D is BCWP - ACWP, which is $8,000 - $9,600 = -$1,600. This indicates a negative cost variance of -$1,600 and can also be seen as a cost overrun on the project. The EV technique obviously blows a lot of traditional techniques out of the water, in that project managers previously only monitored their Gantt charts or separate cost reports generated from financial systems. 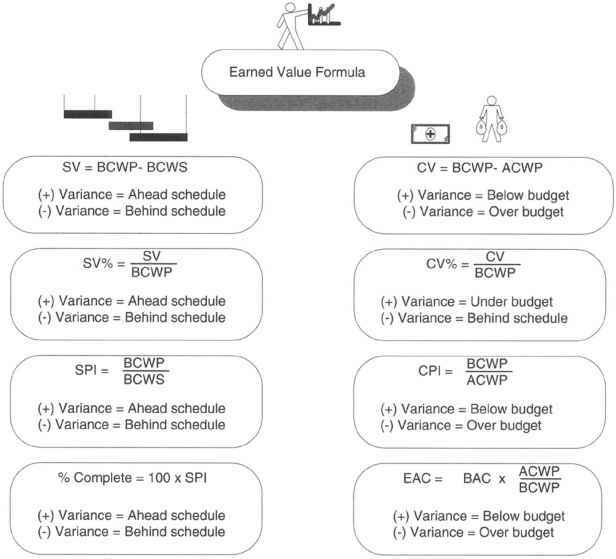 Using earned value, project managers are able to simultaneously monitor and control both schedule and cost using the set of formulae shown in Table 7.2. A project manager uses BCWS to represent the value of work to be budgeted. 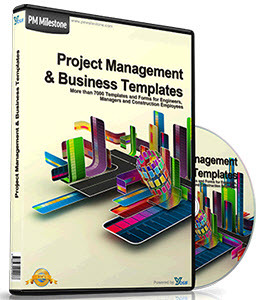 A project manager uses ACWP to represent the actual cost spent to complete the task. This is also known as earned value. This is known as the difference between the planned and actual costs for the completed tasks. It can either be positive or negative in value. This is expressed as a percentage. A positive value is good: It means the project is under budget. However, a negative value means that the project is over budget, and that is cause for immediate correction. This is used to recalculate a project budget, in order to obtain a more accurate value of what the project will cost at the end. Because many clients have their financial departments prepare financial reports and monitor work in progress, either at a project or operational level, these financial reports are generated either at quarterly or monthly. This is accordingly far too late to control project costs and any identified problems, which, in turn, would often be to late for any corrective action to take place. The project manager, on the other hand, cannot wait that long to control his or her project costs and therefore needs to be proactive in much shorter intervals—often on a daily or weekly basis. It is recommended that projects be controlled from the 15 percent mark. There is no doubt that earned value, if properly applied, is highly effective in giving a meaningful measure of progress. And, the principles are just as valid for IT development managers as they are for project managers (see Figure 7.4).